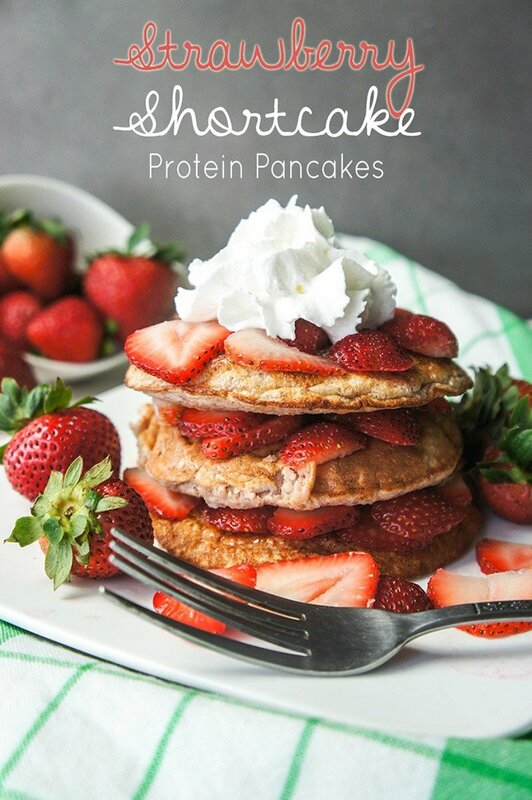 Protein pancakes are a favorite of mine. 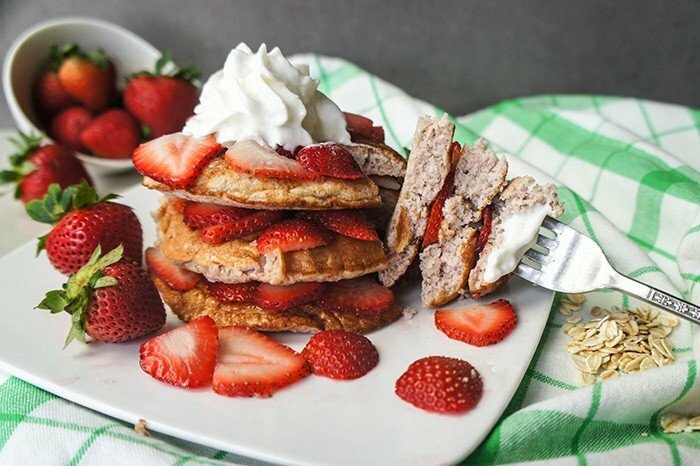 These Strawberry Shortcake Protein Pancakes are a recipe I’ve been making for years. When I eat them for breakfast, they keep me full for a long time. They also are a great home-alone-and-don’t-want-to-cook for one option. I tell myself it’s okay to have pancakes for dinner if they are primarily made of egg whites. The summer I left for Malaysia (over 4 years ago now! ), my youngest cousin was on her way to college. Over 4th of July weekend, her parents helped her move to N. California (they live in Southern), and the family that lives in Oregon drove down. Probably not a normal college student’s dream, to be moved into college by 15 members of her family! Actually, we spared her any embarrassment. We stayed in a big house together, and only a select few were chosen to actually venture on to campus and to her dorm with her. Those are the times I miss most living over here in Malaysia. Staying together, going for hikes and bike rides, and just relaxing with family. On that trip, I made these pancakes for breakfast one morning. They were a hit, and my uncle told me I should write a cookbook– that there were probably a lot of other people out there who would like to cook like me. I thought that was funny, because I had no intention of writing a cookbook. I hadn’t started reading food blogs yet at that point, and didn’t even really consider something like that an option. Fastfoward . . . Hey, Uncle Dan, do you mean share the recipe like this? 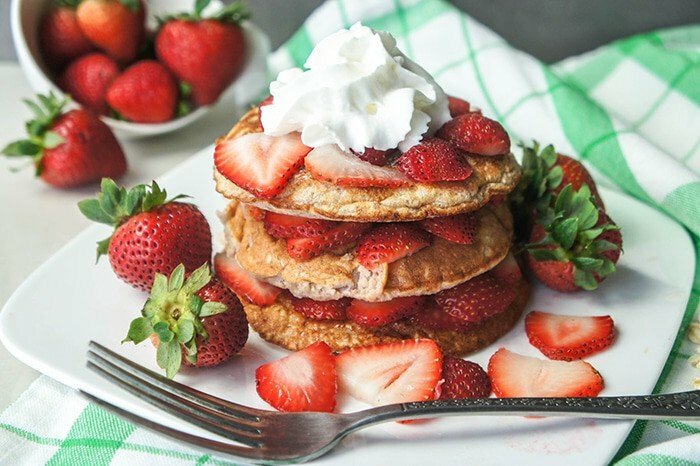 These pancakes are made with high protein, high fiber oat bran and buckwheat to keep them gluten free, egg whites for more protein, and strawberries for sweetness and to keep them moist. They are perfect just like they are, with a little smear of butter. I used to pour powdered sugar on them. Maybe that wasn’t the best “clean eating strategy.” Maybe I was just following the 80/20 rule. My favorite topping as of late is sunflower seed butter! I’ve talked about it before- it’s my recent nut butter obsession. I used to avoid it because it has added sugar and salt, but then I realized, the amount of sugar is pretty negligible, especially when I usually eat it a couple teaspoons, or a tablespoon a day, and not a whole serving. It’s just as high in protein as almond butter. I’ve tried several no-added sweetener brands. The first two (I don’t remember what they were) were absolutely terrible. Then I tried Maranatha Sunflower Butter without sugar, and it was actually very good. However, that was the 1st and only time I’ve seen it here in Malaysia. Those of you who have never lived outside the United States, you can’t imagine what a luxury it is to be able to just buy what you want, when you want! Even online shopping here in Asia doesn’t fill in the gaps of what’s not consistently available here. And there’s no “special orders” at the grocery stores here. I am pretty sure even the people doing the ordering for the stores have very little control over what actually comes in. It seems so random! I find products I love, buy them, and then can’t find them again for years. Literally, years. But that’s not about pancakes. 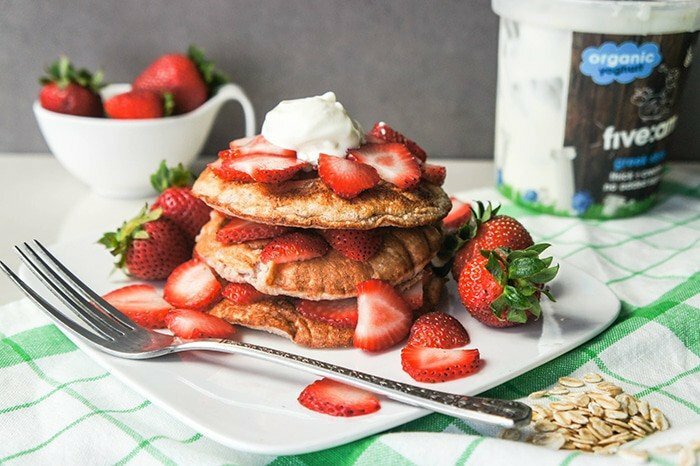 These strawberry shortcake protein pancakes do not need unsweetened sunflower seed butter to be tasty. Other favorite toppings– bananas, greek yogurt, coconut whipped cream, or a drizzle of honey. And of course, lots of sweet strawberries. A quick, delicious breakfast (or dinner! ), packed with protein and fiber. Top with nut butter, yogurt, or fruit for a delicious, clean meal. Add egg whites, chopped strawberries, oat bran, buckwheat flour, baking soda and salt to a blender. Pulse 5-6 times, until ingredients are just combined. Spray a frying pan with coconut oil or other cooking spray. The pancakes will spread out, so using a smaller pan works well. Cook on low, covered, for 5-7 minutes, until bubbles appear on top of pancake. Flip over, and cook for another 1-2 minutes. Top with berries, nut butter, or coconut whipped cream. Makes 6 small or two large pancakes. The look pretty in stacks, but I personally prefer making 1 large pancake for myself. Since these pancakes are made mostly of egg whites, they need to be cooked slowly to not dry out. I find slightly undercooked pancakes taste the best! Yum, these sound good! I recently started adding some vanilla protein powder to pancake mix for days when I don't feel up to cooking and I've been loving it! When I add maple syrup and strawberries it tastes like angel food cake. Need to pin this recipe to try later. They are my favorite protein pancake recipe. I find making protein pancakes with egg whites instead of a powder makes them taste closer to a real pancake, and keeps them moist. These pancakes look delicious Michelle! I definitely need to recreate the recipe.. I love strawberries and I strangely also love the taste of protein power.. thanks for the great ideas. i love high protein recipes. they look great! Yum! 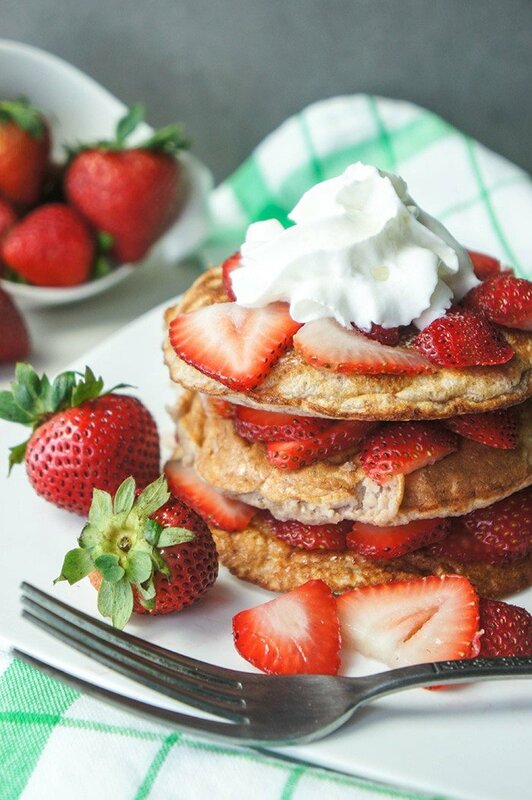 I love the idea of pulsing the strawberries in with the pancake batter. Pinned! I adore pancakes - can never have enough recipes for them. Love the idea of adding strawberries into the batter like that. Must give it a try!